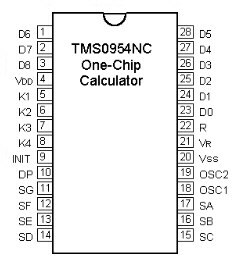 The TMS0954 is a close relative to the TMS0952 with some changes in the ROM code. The TMS0954 uses a standard DIP-28 package. The keyboards of the TI-1260 consist of a x/y-matrix connected to six segment-driver outputs and the keymatrix inputs K1 to K4. The Power on reset is not connected to any key. The TI-1260 based on the TMS0954 uses a 9-digit LED-display with common cathode architecture. One typical display is the LED-stick 233.